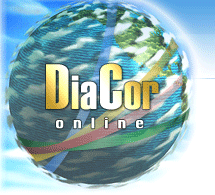 Hardware and software package «Intera Vector-BIOPSI-DiaCor» is designed for determination and evaluation of the functional condition of human organism. 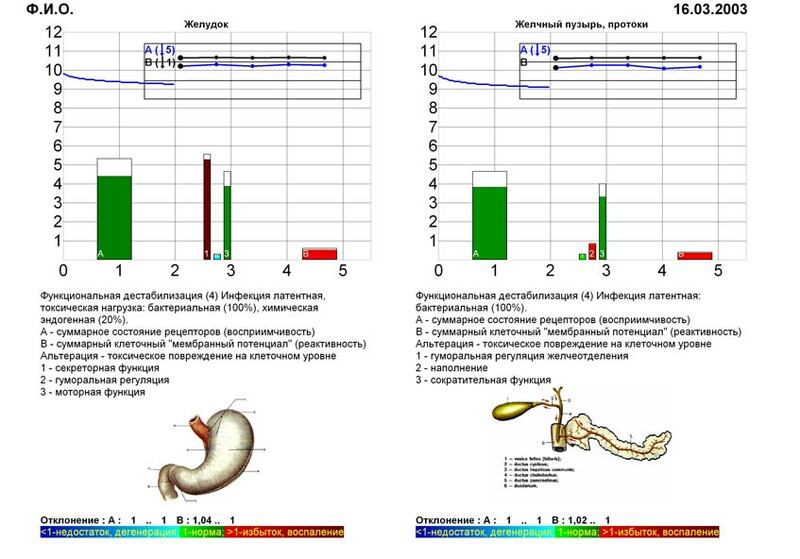 Computerized diagnostics of human health condition is based on registration of parameters of zonal conductivity under conditions of the direct current from different body areas and receptor zones that are functionally associated with certain internal organs. To the appointed skin areas (forehead, hands and feet) by a contact method there are applied six electrodes by means of which an electric signal of low intensity is recorded. Recording of electrical patterns under conditions of the direct current is consecutively conducted in 30 vector directions in the mode of multiple repetitive recordings that allows statistically average the parameters of measurement during the process of diagnostics in order to receive reliable figures (mode of scrolling). In our package, in contrast to electrocardiography, encephalography or myography there is fixed not an alternating current of high frequency (such as “action potential”), the summarized registration of which is executed by these methods, but the conductivity of the direct current between various pairs of electrodes. (!) This allows to estimate the qualitative summarized values of “membranous potentials” and response of cell receptors of various organs to effects of external environment that reflects their functional condition on a cellular level (pic. 3 - 5). 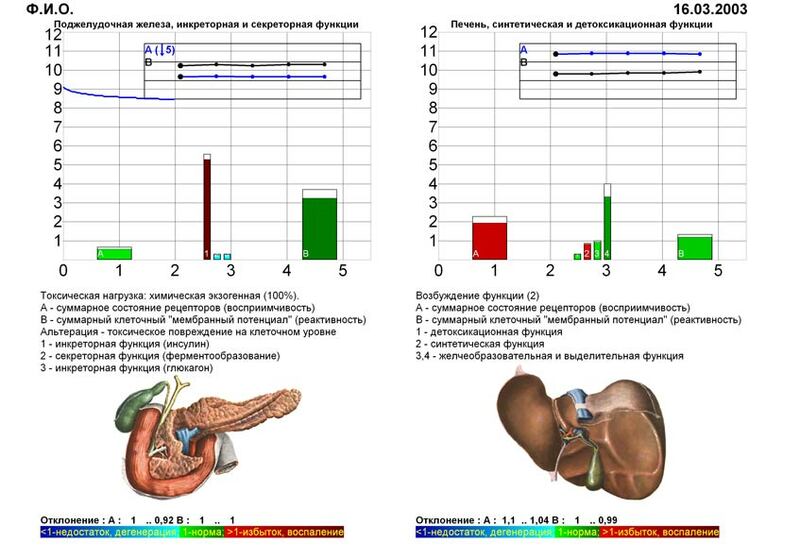 At the same time there is defined a dominant type of vegetative regulation on various levels: sympathetic or parasympathetic (in the mode of vegetative test) as well as vegetative reactions lability (calibration mode). One of the main tasks of the presented methodic of functional diagnostics is (!) the estimation of the individual mechanisms of the informational regulation of a homeostasis that have a direct connection with lymphatic system, their dynamic consequence at the level of the entire organism and individual organs at the cellular level.. 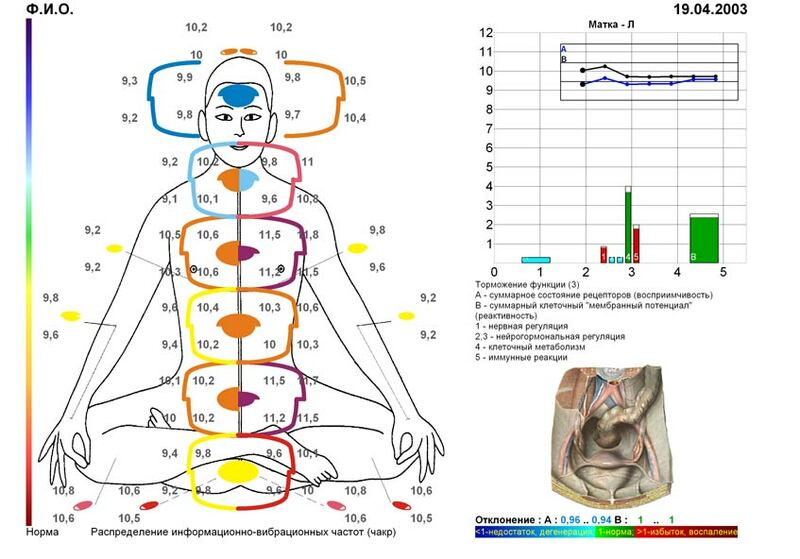 In the presented diagnostic package there are also used algorithms of interpretation of functional condition in the insight and conception of the doctors of antiquity (Tibet and China) that permits to correlate the informational factor of medicinal action the most adequately by taking into account their knowledge about healing properties of natural remedies (man-in-yan mode). 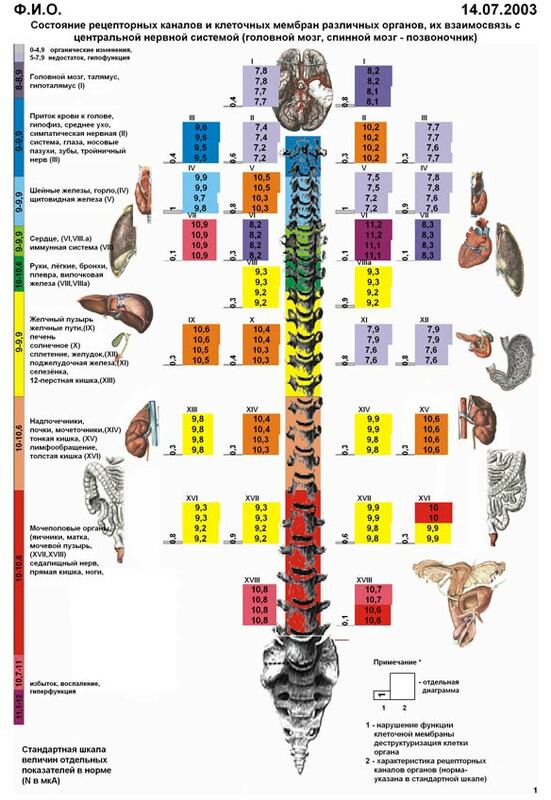 Using of symmetrical leads allows to conduct a functional diagnostics of vertebral column (the mode of “color diagrams - organs”, pic.6). (!) In this package is implemented a principle of individual selection and informational compliance of the natural remedies for treatment and prevention (medicinal plants, minerals, metals etc.) 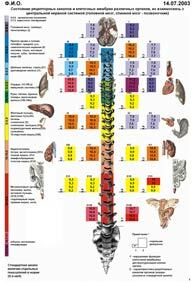 taking into consideration functional impairments of one or another organs or systems (mode of scanning - remedies). Using certain criteria of assessment of functional condition allows to define a parasitic, bacterial or viral burden as well as a propensity for oncological diseases. In this regimen there is also possible a prognostic estimation of the development of pathological impairments with the course of time (mode: absolute value, selection of coefficient). The diagnostic criteria mentioned above widen the opportunities of use of functional diagnostics methods, allows to correlate the received results with findings of other methods that are used in the clinical practice with a purpose of early reveal of the existing pathology and its adequate diagnostics. This is especially important in practical medicine as the deviations at this level appear before the manifestation of the clinical symptoms.